Shah Abdul Latif Bhittai was born in 1689 in Hala Haveli's village Sui-Qandar located near Hyderabad, Pakistan. 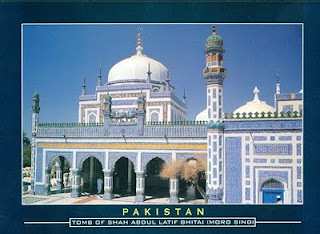 Shah Abdul Latif was son of Syed Habibullah and grandson of Syed Abdul Quddus Shah. He settled in the town of Bhit Shah in Matiari, Pakistan where his shrine is located. The major themes of his poetry include Unity of God, love for Prophet, religious tolerance and humanistic values. Most of the information that has come down to us has been collected from oral traditions. A renowned Pakistani scholar, educationist, and a foremost writer of plays, dramas and stories, Mirza Kalich Beg has rendered a yeoman service to Sindhi literature by collecting details about the early life of Shah Bhittai, from the dialogues that he has constantly held with some of the old folks, still living at that time, who knew these facts from their fathers and grandfathers for they had seen Shah Latif in person and had even spoken to him. He was born around 1689 CE (1102 A.H.) to Shah Habib in the village Sui-Qandar a few miles to the east of the present town of Bhit Shah (named after him), on Safar 14, 1102 A.H. ie November 18, 1690 CE. He died at Bhit Shah on Safar 14, 1165 A.H., ie January 3, 1752 CE. In his memory, every year, on 14th Safar of the Hijri Calendar, an Urs is held at Bhit Shah, where he spent the last years of his life and where his elaborate and elegant mausoleum stands. Latif got his early education in the school (maktab) of Akhund Noor Muhammad in basic Persian (the government language at that time) and Sindhi (local spoken language). He also learned the Qur'an. His correspondence in Persian with contemporary scholar Makhdoom Moinuddin Thattavi, as contained in the Risala-i-Owaisi, bears witness to his scholastic competence.